There are certain things in life that instantly and easily lend themselves to interpretation and adaptation in a board game. Farming, naturally. War, racing, and buying/trading on the stock market are practically games already. But until recently, one of the only recourses an entrepreneurial zealot had at the game table was to roll dice and move a little Scottie past Go. Enter crowdfunding; suddenly, games about business and start-ups became not only viable, but incredibly meta, making funding such entrepreneurial ventures possible. Startup Fever hit Kickstarter last spring and found gangbuster sales, while Briefcase tore through Indiegogo earlier this year. Now, Tasty Minstrel Games has entered the startup fray with Ground Floor on Kickstarter. And I’m here to tell you, unlike the tiny infrastructure that typically accompanies the budding businesses depicted in the game, Ground Floor is anything but tiny. This is big business, with a capital big. 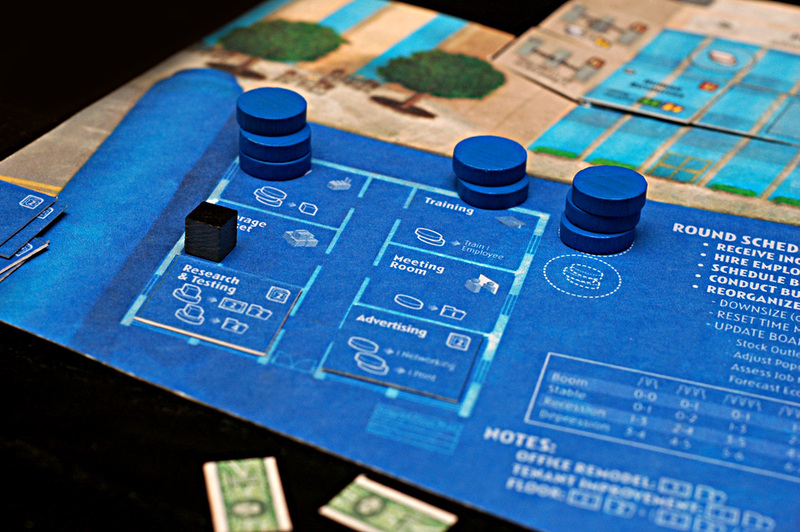 In Ground Floor, players take on the roles of young business owners trying their best to improve the prestige of their startups through advertising, shrewd manufacture and pricing, improvements to infrastructure, and careful monitoring of the economic climate. If that sounds like a lot to keep track of, it is – but in an often-delightfully thinky way. 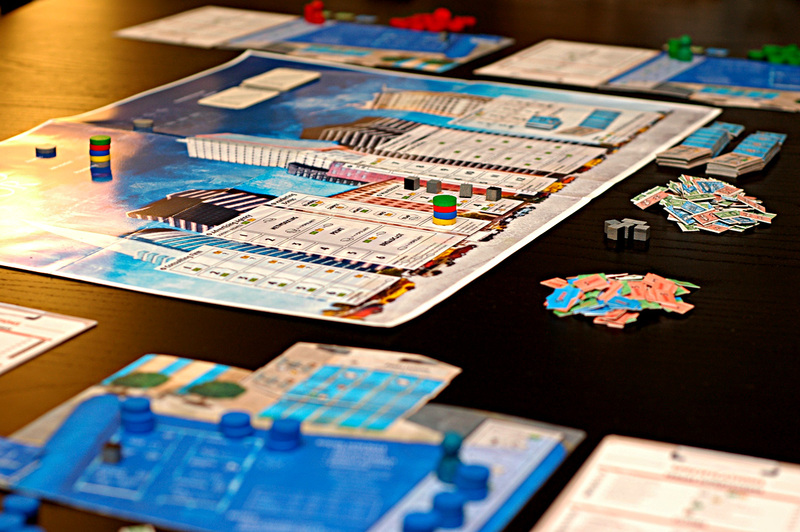 At the start of the game, each player receives a personal player board that represents the ground floor of their fledgling business, as well as the particular sector in which it specializes (such as non-profit, publishing, or emerging technologies). This board tracks the number of employees in the company, as well as the units of time (the most important resource) those requisite employees grant to the player. 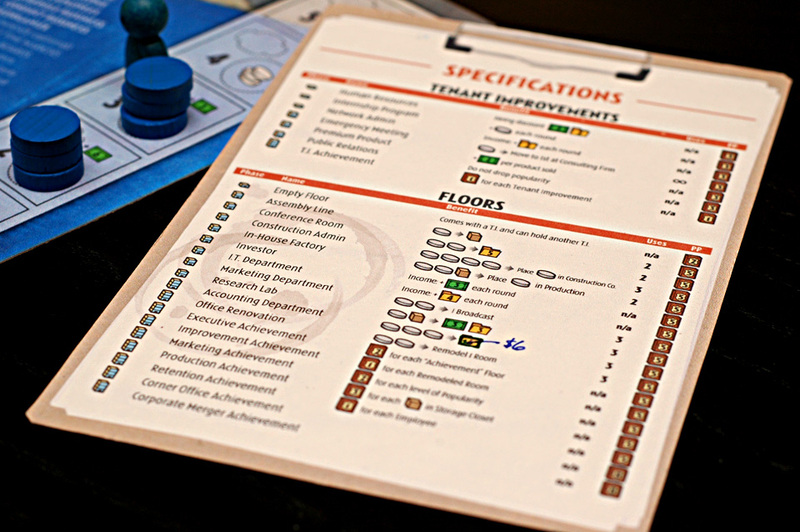 These time units are placed on the ground floor boards and the main game board to perform actions over the course of the game, such as training new employees, improving marketing and company popularity, or manufacturing and selling goods. The Ground Floor, as it were - the player board, where the magic happens. Performing all the actions in the game requires not only time but two other valuable resources: Money and information. Both can be acquired in various ways by devoting time to several intriguing avenues such as utilizing supply cubes (typically used to manufacture and sell a good) for research & development, hiring a consulting firm (the biggest pay-out in info. in the game), and even simply holding a meeting, where one unit of time (typically) rewards the player with one unit of info. Sometimes you can make your building REALLY tall; this is the 7-story beauty from my last game. All of this jockeying for resources is typical for the Euro heart that beats at the center of Ground Floor, but its real core lies in business upgrades. Each player has the opportunity over the course of the game to improve the building infrastructure of their businesses, which grants the player end-game prestige points, as well as special actions, abilities or improvements on the base actions that are available on the ground floor player boards at the beginning of the game. The upgrades system and components are truly what make Ground Floor shine and feel like a polished product. 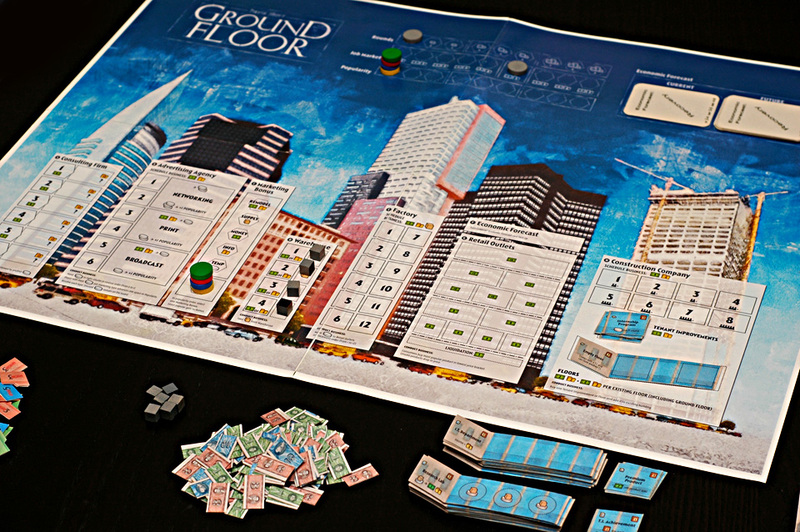 The Floor upgrades are represented by uniquely-cut punchboard chits that fit onto a player’s ground floor board and make a player’s building “grow,” creating satisfyingly-tall skyscrapers by the end of the game. The main board with all action spaces. Floors and Tenant Improvements (building upgrades) are in the lower right. TMG definitely has not strayed too far from their base formula here, and that’s not a bad thing; Ground Floor is a bit of a brain burner in the vein of Belfort and Homesteaders. However, unlike those two classic titles, Ground Floor is lacking a tiny bit of heart. That’s not to say that Ground Floor doesn’t adequately capture the tough decisions, responsibility juggling, and resultant rush of managing and succeeding in small business, but some gamers may feel that it emulates it all a little too well. For instance, one player that tested the game with me mentioned that it felt oddly – but appropriately – corporate. In the end, I believe the key word here is appropriate; after all, in Ground Floor we’re not dealing with trading apples for cows or using dwarves and elves to build a brewpub. There are a lot of upgrades in the game. Luckily, you have help. 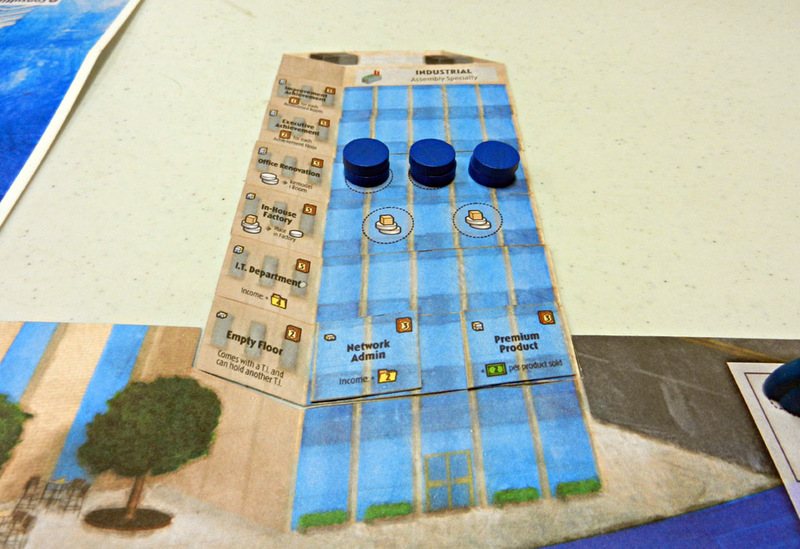 Overall, I found Ground Floor to be a satisfying Euro experience, especially after learning the ropes in the first play. 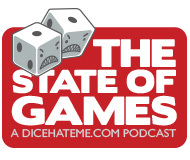 This is a game that certainly rewards repeated play; there are simply too many different strategic and tactical routes to take from game to game to play just a couple of times and shelve it for months. And even if after a few plays you find one particular business type and strategy to be more your style than others, the actions of the other players and the economic shifts ensure that you won’t get stuck in a rut – and if you do, you’ll soon find your plans to be the next Trump will get you fired, instead. In summary, Ground Floor will definitely scratch that itch for a deep and immersive entrepreneurial simulation, if that’s your sort of thing. Fans of TMG’s meatier games will certainly be satisfied as long as they pledge with the mindset of gaming within a corporate atmosphere. I believe most will understand and embrace the concepts; after all, it’s nothing personal – it’s just business. 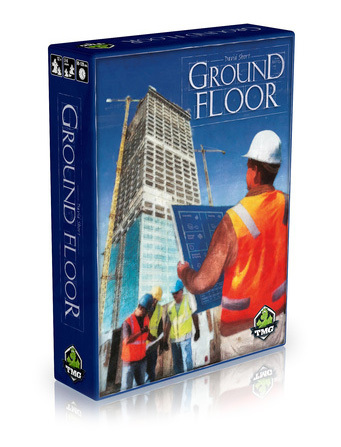 I’d be interested what game you think Ground Floor is most similar to. I haven’t played Homesteaders or Belfort. Simon – That’s a tough question, actually. It has some inklings of Puerto Rico about it, at least in the engine-building and improvements aspects. The “worker placement” portion harkens a bit to Fresco, although Ground Floor is far more complex. I’d be hard-pressed to name something else it is similar to, at least in the games that I can think of. If you name off a few of the Euros you’ve played, I could probably narrow it down a bit. Great article. Love your turns of phrase, and how you tell the story. It seems a little bit like, um, Drum Roll or Pillars of the Earth. When I think of those games, it seems like they both focus on players chaining a number of resources and mashing them together into the final product. Further, it seems similar to, at least, the Pillars of the Earth because the upgrades seem focused on helping the player make his or her machine run better, rather than just fudging with the scoring system. Though I have a question about the upgrades, are they limited in number, or does every player have access to the same floors and new rooms? If Ground Floor allows that, then it seems “a lot” different than the two games that came to my mind, as I think they both have limited numbers of upgrades, so they force players to diversify. It’d be kind of neat if Ground Floor allowed for a friend and I to follow the same path with our businesses growing, and I just find out that I don’t have the sharpest mind when it comes to telling people how to spend their time.